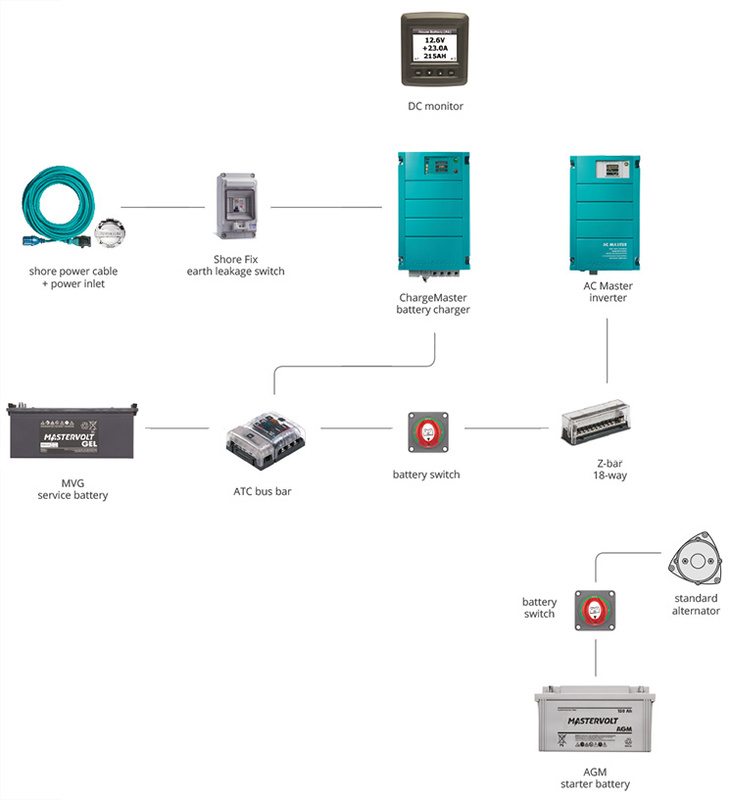 The Mastervolt system described below assumes a frequently occurring situation. You cruise out of the marina in the morning and plan to spend the day with two to four people, enjoying time on the water onboard your motoryacht. In the evening you either cruise back to your home port or hop from one marina to the next where you have access to shore power. The usual appliances are always onboard and you also want to use the equipment that you brought with you such as a laptop. The maximum AC capacity is 50 watt for the laptop and telephone/tablet charger. Your navigation station has, for example, a GPS, speedometer and depth gauge. A system with separate battery charger and inverter provides the highest flexibility and reliability. The charger will always provide the optimum charge even when the available shore power is limited, fluctuating or unreliable. The inverter will provide a perfect true sine wave output to your sensitive onboard electronics. Power is available when you need it. The total of AC and DC consumers requires around 0.6 kWh. Totally discharging the batteries is not advisable so opt for a maximum of 50 % discharge = 1.2 kWh. Taking into account ease of installation and the amount of standard equipment (such as lighting) we selected a 12 V system. The required battery capacity is 1.2 kWh/12 V = 100 Ah. In normal conditions we assume 25 % of the battery capacity when selecting a battery charger: 25 % of 100 Ah requires a 25 A battery charger. In this case the ChargeMaster 12/25-3 is an excellent choice. It is even able to charge up to three battery banks. In this case you use two of the three outputs: One for the service battery and one for the starter battery of the engine. This gives you the flexibility should you want to add another battery later. Furthermore, you can use this third output as a second starter battery if you have two engines, or for a bowthruster battery. Configure the DCSM to show the data in analogue, digital and graphic form. Monitors the charge and discharge amps for two banks, capacity remaining in Ah and %, battery condition, tank fluid level and status of important circuits (on/off).